These vegan truffles are a perfect after-dinner dessert. They very simple and can be whipped up in minutes. Sweet, creamy and chocolatey…all of the things you would want in a truffle. Oh! I almost forgot to mention, they are packed with antioxidants, phytochemicals and fiber. I knew you were going to wonder about that. This recipe uses dried plums as the base instead of heavy cream, butter and sugar. It is a great swap while maintaining a lot of flavor. Combine all ingredients in a food processor. Alternate blending and scraping down the sides until everything is evenly incorporated. You may need a few drops of water to loosen the mixture, make sure to keep it a thick paste. 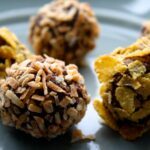 Remove mixture from processor and form into balls by tablespoon. Wet hands with water to make the rolling process easier. Roll balls through preferred topping. I used toasted shredded coconut and corn flakes but chopped nuts, powdered sugar, cocoa and sprinkles are great as well. Refrigerate for an hour to firm up. *If you don’t have PB2 substitute 1 tablespoon peanut butter and increase the cocoa powder by 1 teaspoon.